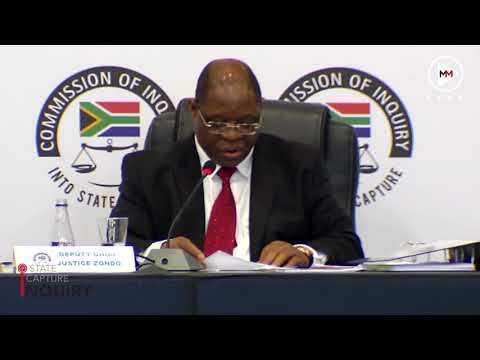 In a surprise announcement on Thursday Deputy Chief Justice Raymond Zondo said that he would like former president Jacob Zuma to respond to allegations against him stemming from witness testimony at the state capture inquiry. The judge made the announcement a day after Zuma told students at the Walter Sisulu University that “there is no state capture in South Africa”. Zuma’s lawyers had informed the commission last week that he was not applying to cross examine any witnesses as he believed that none of the evidence presented implicated him. But Zondo said it was now his “wish” that Zuma respond to the allegations by Mentor and Maseko. “I have invited the lawyers for former president and indicated my wish that he could put his version in an affidavit to assist the commission,” said Zondo. Zuma has refused on numerous occasions, including in parliament while he was president, to respond to allegations of state capture and explain his relationship with the Guptas. Speaking of the cuff at a Sasco event at the Walter Sisulu University on Wednesday, Zuma said state capture was just a “politically-decorated expression”. “My view, and I am not disagreeing with anyone, these are politically decorated expressions. There is no state that is captured. Some people were doing things with [other] people” said Zuma. A lawyer working for the commission told TimesLive that Zondo had the power to summon Zuma to explain his comments and to find out what he meant by it. Zondo did however not mention Zuma’s public comments but his invitation to the former president forces him for the first time to formally respond to the allegations against him. Earlier Zondo dismissed an application by Ajay and Rajesh Gupta to cross examine Mentor, Maseko and former deputy finance minister Mcebisi Jonas. He said this was because the Gupta brothers refused to return to South Africa to testify before the commission in person fearing their arrest. “The world will know that they elected for their side of the story not to be heard,” said Zondo. Zondo granted Duduzane Zuma leave to cross examine Jonas as he has now agreed to give evidence to the commission.